Situated within the tourist destination of Colorado Springs, Cheyenne Mountain Resort features breathtaking sights, an 18-hole golf course, and a state-of-the-art spa. 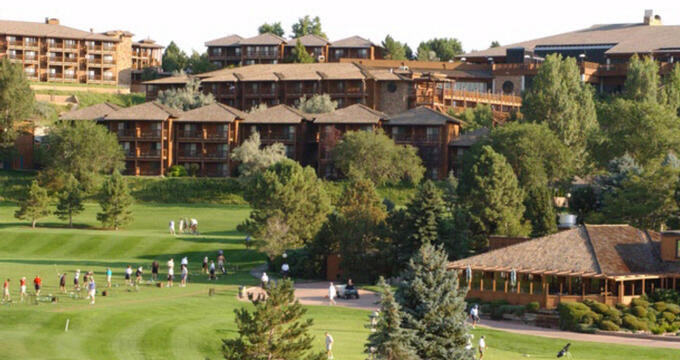 Cheyenne Mountain Resort is ideal for family vacations, getaways with friends, or romantic trips. 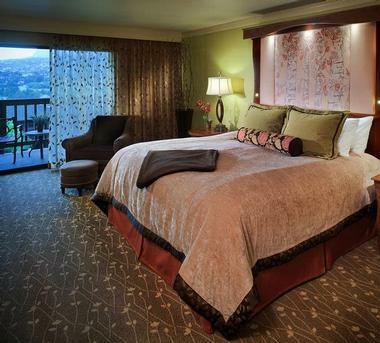 With 316 guest rooms and suites, Cheyenne Mountain Resort boasts homey décor, up-to-date amenities, and comfortable bedding. Each room contains a private balcony, specialty bath products from the resort’s spa, and a mini-fridge. Guests can choose from the Standard Double Queen, Deluxe Double Queen, Deluxe King, or Executive King Rooms. Standard Double Queen: With 430 square feet, the Standard Double Queen room can accommodate 4 guests. The balcony provides a view of the courtyard. Deluxe Double Queen: The Deluxe Double Queen room also accommodates 4 guests and has 430 square feet. Its balcony offers a view of the resort. Deluxe King: The Deluxe King room has 430 square feet of space. Its balcony provides a view of the resort, and it can sleep two guests. Executive King: The Executive King room is also 430 square feet. Guests can view the resort from the room’s balcony, and it includes a pullout couch or a tub with jets. This room can accommodate up to 3 guests. For more space, guests can also book the One Bedroom Junior Suite or Presidential Suite. One Bedroom Junior Suite: The One Bedroom Junior Suite offers visitors a private bedroom, two bathrooms, two balconies, and a large living space. The living space includes pull out couches for additional guests, sleeping up to 4 guests total. The Presidential Suite: The Presidential Suite offers 1130 square feet of space. This suite offers multiple beautiful views of Cheyenne Mountain, a full bar, and functioning fireplace. The Presidential Suite also includes separate living areas, a dining area, and multiple bedrooms. This facility can be booked to include one or two bedrooms with either queen-sized beds or king-sized beds. Cheyenne Mountain Resort also offers pet friendly lodging. 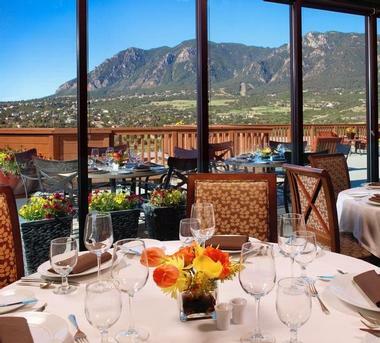 Cheyenne Mountain Resort features a slew of dining options for guests to enjoy during their stay. The Elevations Lounge is a restaurant and bar that highlights local and seasonal cuisine. Guests can enjoy hearty pub fare and local beers beside panoramic windows that offer views of Cheyenne Mountain. The Elevations Lounge invites visitors to stay awhile with its televisions, games, and comfortable seating. Guests can also enjoy their drinks on the outdoor terrace amidst the beauty of the Rocky Mountains. As the resort’s signature restaurant, Mountain View Restaurant is open for breakfast, lunch, and dinner. The restaurant features an expansive selection of beverages and dishes, as well as a brunch option on Sundays. For visitors of the resort’s golf course, Gates Grille is perfect for a casual meal and drinks after a day of recreation on the resort’s fairways. Gates Grille offers indoor and outdoor dining spaces, and is open seasonally. Cheyenne Mountain Resort also offers room service throughout the day to guests of the resort. Available for breakfast, lunch, and dinner, in-room dining can be ordered by phone and is delivered quickly. Guests can also visit Cheyenne Mountain Resort’s General Store. This shop features baked goods, ice cream, and coffee. Visitors can also purchase a variety of light snacks from this establishment. For a day of rest and relaxation, guests can head to the Alluvia Spa and Wellness Retreat. For a more therapeutic experience, guests can choose from a selection of massages, body treatments, and facials. Cosmetic treatments, such as nail services, hair styling and makeup, and waxing services are also available to visitors of the Spa. The Spa also offers seasonal spa treatments that take advantage of local ingredients. Billed as one of the top golf courses in the state of Colorado, the golf course at Cheyenne Mountain Resort offers scenic views, challenging courses, and instruction by a professional from the Country Club of Colorado. Visitors can spend the day on the greens, travel about the grounds on a top-of-the-line Golf Board, and then take in a meal at Gates Grille. Cheyenne Mountain Resort also offers a Golf Shop to visitors of the Golf Course. Whether an experienced golfer looking to upgrade or a novice hoping to rent a set of clubs, the Golf Shop has something to offer to golfers of all experience levels. Cheyenne Mountain Resort’s picturesque location and facilities make it ideal for gatherings of any size. Guests looking to book an event at the resort will have a variety of available spaces from which to choose. Whether looking for a meeting space, classroom, or banquet hall, Beaver Creek Lodge offers more than 40,000 square feet of space for visitors to rent. 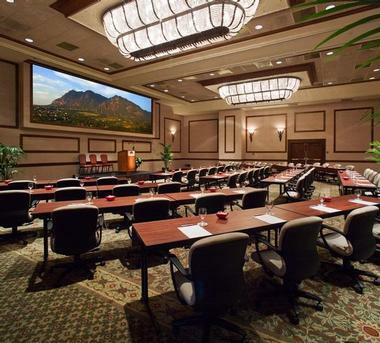 The Cheyenne Mountain Resort Conference Center is perfect for work-related events, while the four ballrooms are commonly used for wedding receptions. Other available facilities include a variety of boardrooms, terraces, and classrooms. Each facility is outfitted with a variety of technological and audio-visual equipment, and catering from the chefs at the resort is available for any event. Couples can make their wedding-day dreams come true at Cheyenne Mountain Resort. The resort offers 217 acres of grounds that can be used for ceremonies or pictures, and guests can choose from several indoor and outdoor venues for their ceremonies and receptions. Wedding venues include outdoor locations such as the resort’s private beach, the Chipping Green, Grand Rivers Terrace, Quail Terrace, Cheyenne Courtyard, and The Pavilion. Indoor weddings can be booked at one of the Cheyenne Mountain Resort’s several ballrooms, including the Colorado Ballroom, the Centennial Ballroom, the Grand Rivers Ballroom, and the Cheyenne Ballroom. The resort supplies multiple wedding packages, rentable décor, culinary services, and ceremony coordination by an on-site wedding planner.